The CEO of the Millennium Challenge Account – Jordan (MCA-Jordan) Eng. Kamal Zoubi has said that MCA-Jordan’s projects in Zarqa Governorate, which are funded by the U.S. Government’s Millennium Challenge Corporation (MCC), are in the final stages of closing out, stressing that these water and sanitation interventions will benefit three million citizens in Zarqa and Amman governorates. Zoubi explained that the $275 million grant Compact funded by MCC included implementing 1,100 km of water and sewage pipelines in addition to expanding As-Samra Wastewater Treatment Plant. “The Compact’s projects are considered one of the largest water infrastructure projects in the history of the Kingdom,” he added. Zoubi clarified that large parts of the new water and wastewater networks are currently in use, encouraging the beneficiaries of the Wastewater Network Project to visit Miyahuna Company to fill out applications in order to link their properties to the network, and stating that Miyahuna Company is willing to facilitate payment in installment for those who cannot pay the fees one-shot. In addition to these infrastructure projects, MCA-Jordan is encouraging citizens to take a more active role in their household water management and conservation efforts through a campaign that carries the slogan “By Water We Live”. The campaign includes a social marketing plan that reaches to school students in collaboration with the Ministry of Education, and utilizes women preachers with the help of the Ministry of Islamic Affairs. In addition the campaign uses women CBO’s workshops, and women plumber programs as well as other channels. “We are delighted to see this awareness campaign acting boldly and innovatively to encourage behavioral change that will lead to better management of the quality and quantity of water inside the houses of Zarqa residents. This intervention has provided in home replacement and repairs of sinks, water pipes, water tanks, and toilets to almost 4,000 households considered to be the poorest in the Governorate,” MCC Resident Country Director Jordan Alex Russin said. Zoubi apologized to the residents of Zarqa Governorate for the inconvenience that resulted out of the large water and wastewater infrastructure works. He said that the hassle, such as dust and noise, will soon end. He also promised that MCA-Jordan will continue to follow up with the responsible consultants and contractors to reduce these disturbances and to be within acceptable levels. Due to the savings achieved by the company, MCA- Jordan was able to allocate a portion of those savings to expand the scope of the water systems to include Jabal Faisal area and Princess Haya area. Moreover, the savings are currently used to construct a new administration building for Water Authority in Zarqa that will help in serving customers in a better way. Since the launch of the Compact in Dec 13, 2011, MCA-Jordan in coordination with MCC effectively operated a monitoring and evaluation system in order to track performance on processes and outputs at the beginning of a Compact’s life as well as tracking high-level outcomes and impacts at the end. Besides, MCA-Jordan has been applying unprecedented international health, safety, environment, and social measures in all our projects, as the safety of the citizens and the workers comprise an essential component of the Compact’s success. 1.Water System Project which includes the extension of 800 km of new pipelines along with 50,000 new water meters and a new Al Basateen pump and tank station to reduce water leakage, and aimed water project to reduce wastage of 50% of the amount - 35% and increase the rate of water supply to citizens from 36 hours to 72 hours per week. 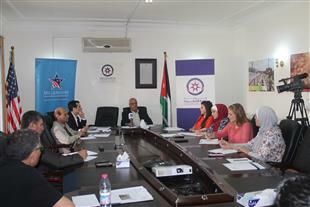 MCA-Jordan has been able to implement approximately 90% of the project until this moment. 2.Wastewater network project, which includes the extension of 300 km of wastewater pipes in Zarqa Governorate. Extending wastewater sewer systems will dramatically reduce sewage overflows into city streets and improve the living and business environment. Adding to that increase the beneficiary areas of the wastewater network will from 72% to 82%. The company was able to implement 93% of the project to this day. 3.The expansion of As-Samra Wastewater Treatment Plant that was delivered in October, 19th 2015, will continue to use the industry’s most modern methods to handle 70% of the country’s entire sewage, including Amman, and provide 133 MCM annually of high quality treated water for irrigation in the Jordan Valley- over 10% of Jordan’s entire annual water.